Another late post. Last week, Baby Iqbal turned 7 months. Since Dear Husband is taking his leave (since 16th July), we brought Baby Iqbal out for 'dinner' at Villa Mauri. 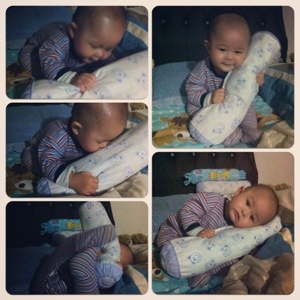 *lol* ;p Ayah and Ibu love you so much Dearest Son! Let's talk about his developmental milestones, shall we? We have changed the size of his bottle teats recently to medium flow. He showed signs of frustration every time we bottle feed him lately so we decided to change the teats size and it works! Yay! He is eating about 2 ounces of pureed fruits or vegetables per feeding, two times a day (lunch and early dinner) and a rusk for breakfast. I have been mixing two different fruits and vegetables lately for him (eg. apple + pear, pumpkin or butternut squash + carrot, and butternut squash + pear). Baby Iqbal is a very happy and curious baby. He loves to smile to everyone - even our tailor can carry him and play with him while I got measured when making baju kurung. We recently (finally!) use the stroller and found out that he can quickly fall asleep while in the stroller. It's amazing because we usually have to swaddle him then rock (and sing) to sleep. When Hubs (and my parents and siblings) came to him while he is sitting down, he would stretches his hands to be carried. Manja! He can now rolls his body (since 6 months) and moves especially when he sleeps. He used to not like tummy time hence I believe his rolling over skills came rather late. I have been showing him how to crawl recently. Hehehe :p I know some babies skip this step so we'll just wait and see. I'm not sure how to write on this. He would usually 'eats' his rattles (soft toys) so we have stopped giving him the rattles. For now, he only gets to hold his teether. His eye stimulation is good though because whenever he hears sound like airplane or car, he'd turn his head. He can say "mamamamama", "yayayayaya" and "bababababa". He gurgles and babbles a lot too. He can understands "makan" and "ngengen" (milk time). I know that we have not been teaching him with readings and all, will get into that soon! ;) Insya Allah..
Baby Iqbal usually wakes up around 9am then we go down to have our breakfast. Then he'll have his shower, milk time and then, take his nap. He'll wake up at lunch time - eats his puree, milk time and then play time with his grandparents and my siblings, or watch tv, or 'walking' around the house in his walker until he is sleepy and take his afternoon nap. His awake time is now longer in the afternoon. Early dinner between 5-6pm then shower, play time, milk time and then he'll sleep for two hours. He'll join us to sleep usually and sometimes we have to force him to sleep - depends on the time he wakes up.